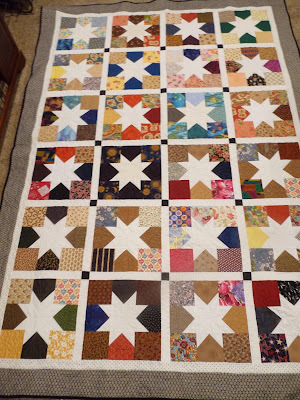 COUNTRY LOG CABIN: SCRAPPY STAR FINISHED! 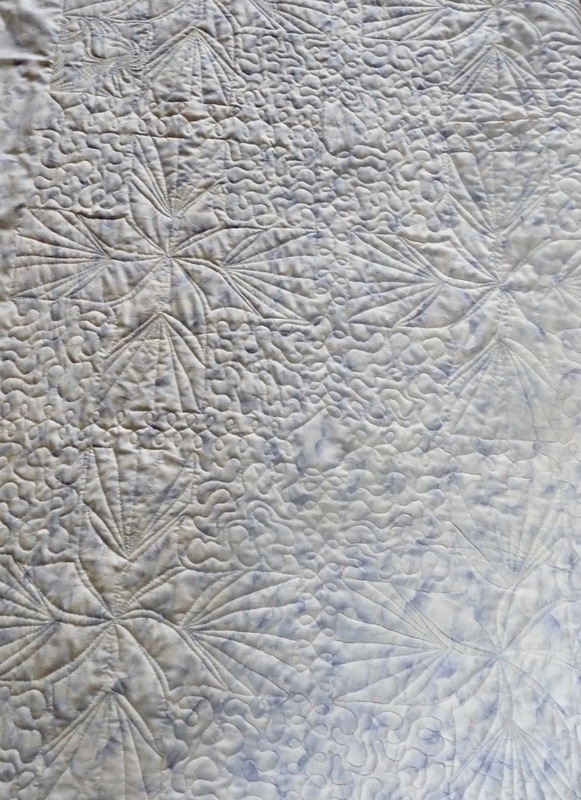 I spent the last week quilting and binding this twin size Scrappy Star quilt. It is a Moda Bake Shop pattern, but I couldn't find it so I could link to it. It is made with 5" charm squares, 8 of them are colored and the middle one is white. I had a lot of left over charm pack squares, so I decided to make it a few months ago. Where did all those left over 5" squares come from? I'm not sure, but the seemed to grow in the bottom drawer of my sewing chest. I still have a lot left. Quilted but not bound yet. Below is another favorite block. Do you see the 2 frogs, fish in upper left and octopus in the lower right square? These blocks were fun to make and they measure 13" square, so it goes pretty fast. Backing fabric was found at an estate sale. All finished. I will take a better picture when I can hang it on the clothesline outside. It always feels good to finish a quilt! 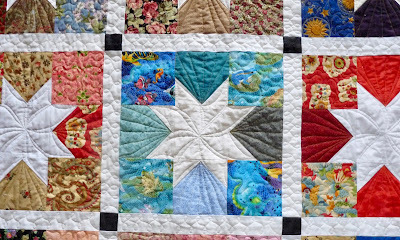 What a very pretty quilt...perfect! What a wonderful way to use up some scraps! 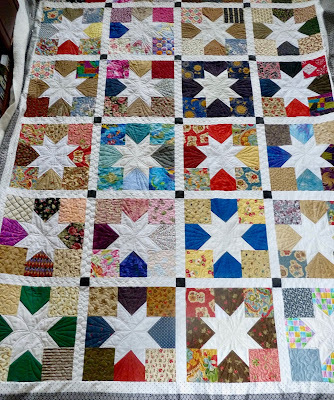 That is a great quilt, love the cute fabrics and your quilting is so pretty! Have fun! ! ! You Dear Jane is Amazingly Gorgeous! 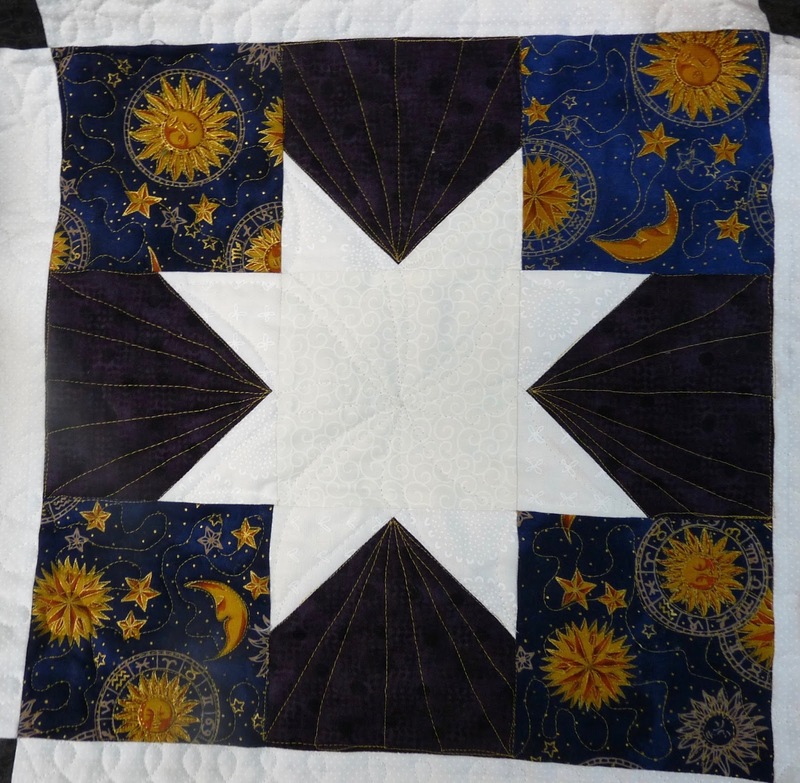 Your star quilt is very pretty; and I love how you quilted it. 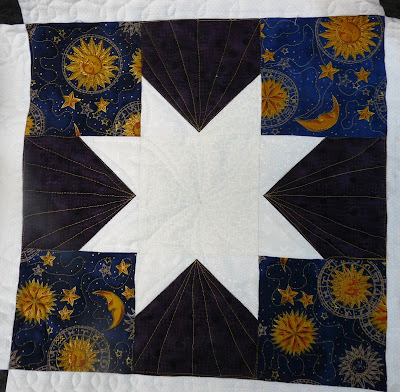 I think it is the same pattern as the star I made last week, but I got the idea from somewhere else. Don't know when I'll get back to mine, but I hope I remember how you quilted yours. I doubt I can quilt mine anywhere as beautiful as your, but I will try --- someday, when I get it together. I'm looking forward to a small finish too early next week if all goes well. ---"Love"
I love the way you mixed in all those fun fabrics! Did you use the stitch and flip method for your star points? Beautiful finish! Beautiful! 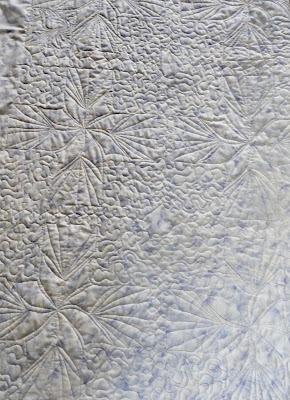 The quilting design is perfect. 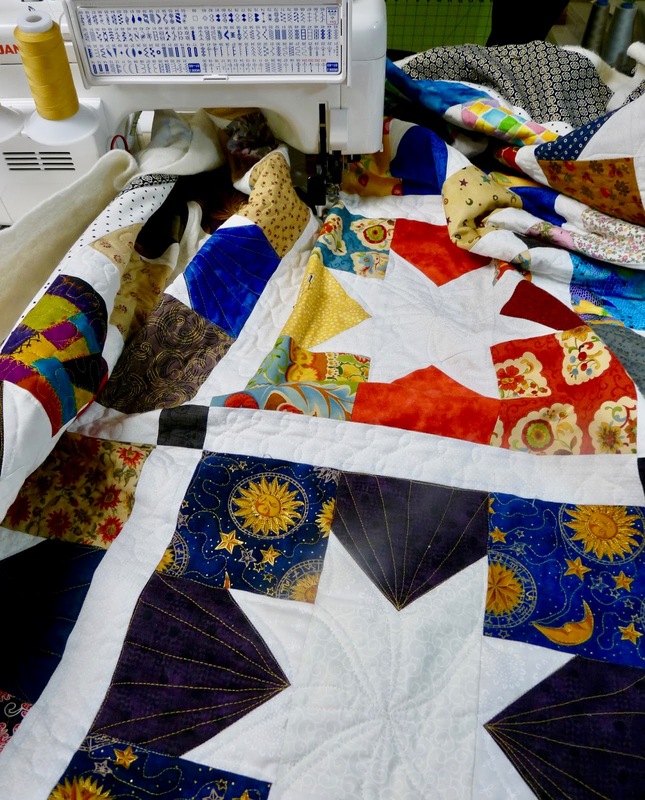 Do you quilt on a long arm or on your sewing machine? Oooooooh so pretty! Love it! Congratulations on your new finish. what a fun study of fabrics! It's gorgeous Ruth! 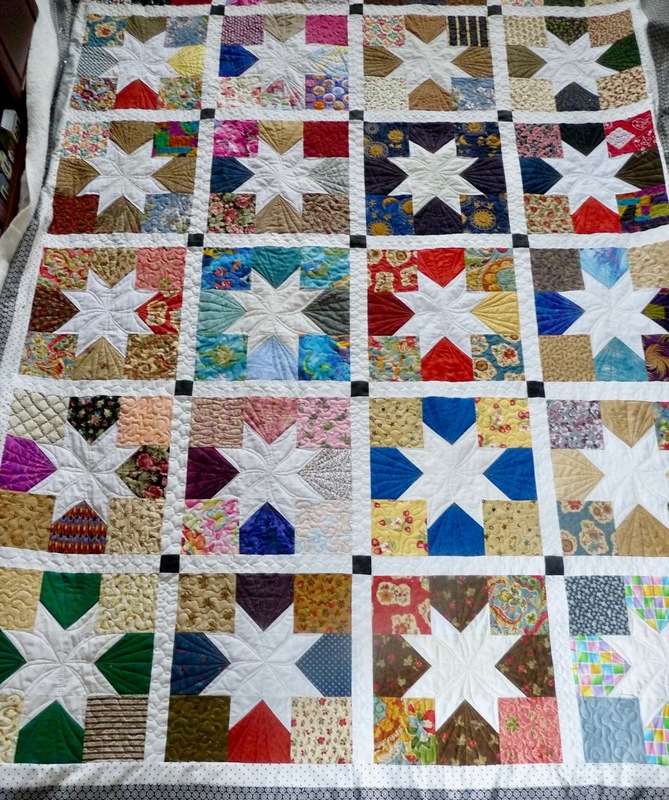 Your quilting is phenomenal and I always love a scrappy one. 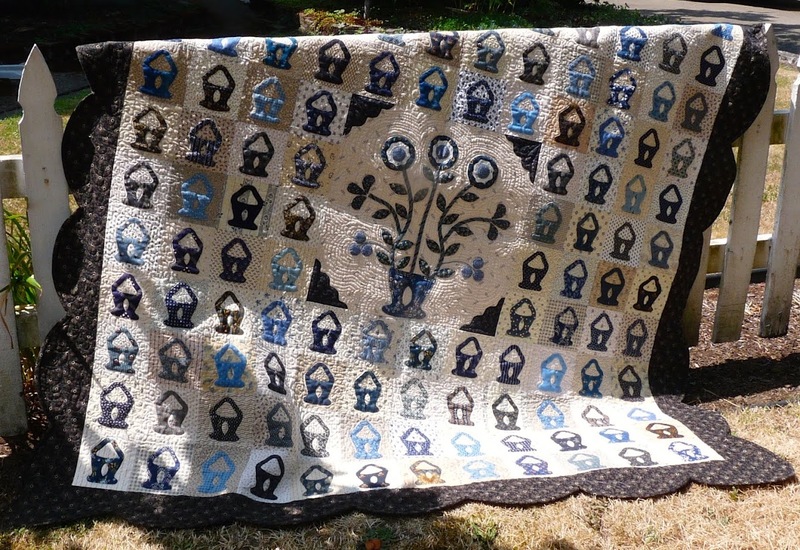 Such a lovely quilt! It's always good to use up what you have , when you can.